Defending champions, Nigeria Customs Service (NCS) today opened the defense of their Maritime Cup title on a bright note as they defeated hard fighting Dominion Divine Freight Forwarders (DDFF) 2-1 in the opening match of the 2014 Ships & Ports Soccer Challenge, also known as the Maritime Cup competition. Dominion Divine had scored the first goal of the match through Obinna Nwankwo via penalty kick in the 19th minute of the first half. But Customs equalized in the 37th minute through Abubakar Mikail. Customs scored its second goal in the 82nd minute of the match through Tenyon Yenne thereby snatching an early victory in the competition. Speaking earlier during the Opening Ceremony of the annual competition, President General of the Nigerian Football and Other Sports Supporters Club, Dr. Rafiu Ladipo, commended the organizers of the competition for introducing sports into the otherwise serious maritime industry. Ladipo, himself a clearing agent and former President of the Association of Nigerian Licensed Customs Agents (ANLCA), said the competition will build the bridge of friendship and cooperation in the maritime industry. He charged the teams to embrace fair play and give in their best in the tournament. “I am a clearing agent and I am proud to say it anytime. Many people think I make money in supporters club but they are wrong. The money I make as a clearing agent is what I even spend to promote the supporters club,” he said. On his part, Chief Executive Officer of Ships & Ports Communication Company – organizers of the competition – Mr. Bolaji Akinola, commended the teams that are participating in this year’s edition of the competition. Akinola said that the competition has come of age and has enjoyed the support of maritime industry operators and regulators. He said 12 teams are participating in this year’s competition. The teams, according to him, are former champion Micura Stevedoring Services, Sifax Group and African Circle in Group A; Nigerian Navy, Apapa Bulk Terminal Limited and ENL Consortium in Group B; defending three times champions Nigeria Customs Service, Nigerian Shippers’ Council and Dominion Divine Freight Forwarders in Group C; and National Association of Government Approved Freight Forwarders (NAGAFF), Mickey Excellency Clearing & Forwarding Agency and APM Terminals Apapa Limited in Group D.
He said the competition will run for twelve days from 31st March to 11th April, 2014. “Adequate arrangements and security measures have been put in place to ensure hitch-free competition. The competition was instituted in 2009 to encourage healthy recreation and rekindle the spirit of friendship and camaraderie among operators and regulators in the maritime industry. I enjoin you to enjoy your participation and build friendship among yourselves. 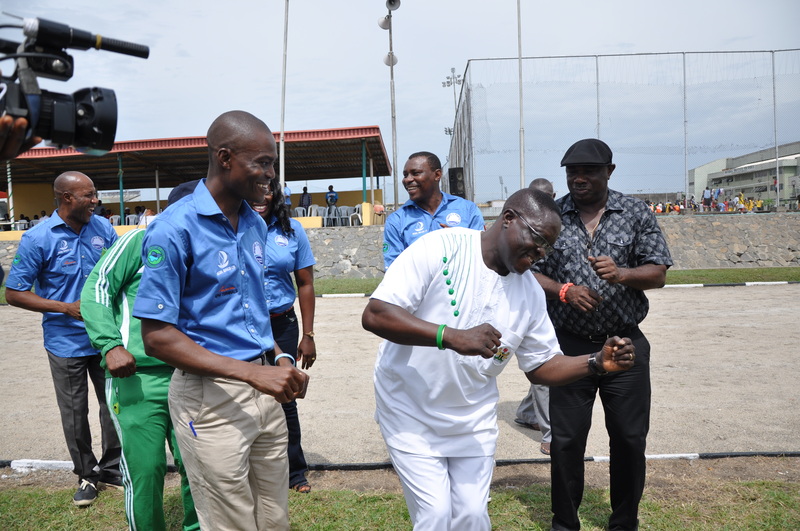 Winning the trophy should not be a do or die affair,” Akinola told his audience during the opening ceremony. The Maritime Cup trophy is sponsored by Micura Stevedoring Services and named in honour of Late Pa John Okunloye – the deceased father of Chairman, Seaport Terminal Operators Association of Nigeria, Princess (Dr.) Vicky Haastrup.